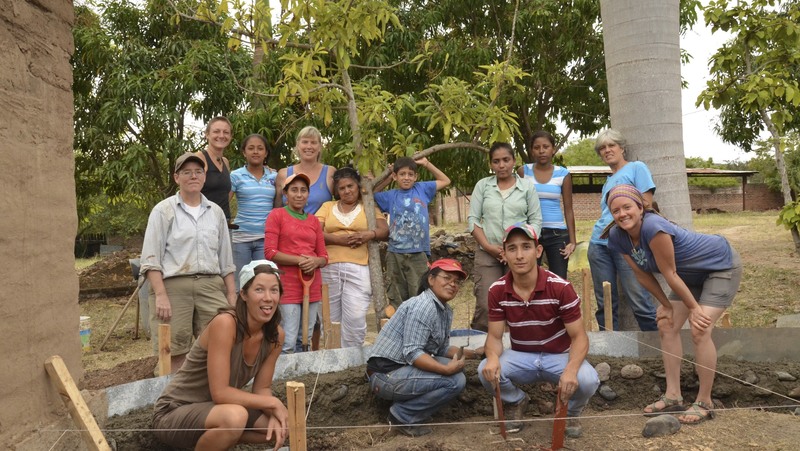 The Year 2013 starts with two grassroots Natural Building projects in northern Nicaragua. Liz Johndrow of Earthen Endeavors invited me to join her as an assistant for two natural building courses. The group we are working with in Condega, Estelí region, is an organization called Asociación de Mujeres Constructoras de Condega (AMCC) – „Association of Women Builders of Condega“. The AMCC is a non-profit organization with the objective of promoting economic, political and ideological empowering of young and adult women so they can exercise their full citizenship. The aim of the organization is to break traditional gender roles of the patriarchal Nicaraguan society by developing different programs, which include a technical training school for women, awareness raising and sustainability and capacity building. Building with natural materials has a long tradition in Latin America but its reputation has suffered due to western development doctrine, health issues around the chagas disease and the loss of local knowledge when it comes to building techniques. These days, living in an earthen house means being poor, underdeveloped and rural. Of course, nobody wants to be put into these categories. Since earth is a free and abundant material, it was discredited by the marketing efforts of the building industry. This is why many people prefer to live in „modern“ houses made of cement block, even though material costs are higher when compared with natural materials, they are not suitable for (sub-)tropical climate due to the thermal performance and the high-embodied energy has a negative impact on the environment. Fortunately there is a raising awareness around environmental issues and the advantages of adobe and taquezal buildings and people of rural Nicaragua are starting to reclaim earth as an excellent building material. The AMCC regularly organizes natural building courses for interested people to re-learn ancient techniques and traditional knowledge around building with adobe or taquezal. The participation in the courses is usually free of charge. Participants in our course include energetic and eager to learn women of all ages and skeptical men who are having a hard time being instructed by women. 15-year old Suleydi is learning heaps as we go and wants to join us for the second building course in Sabana Grande. Doña Teresa is 52 years old and wants to teach her grandchildren how to build a natural home. Sylvia is here because her family house got flooded and she wants to rebuild it. Olinca studied environmental engineering and is interested in natural building because it is sustainable and friendly to the environment. Our male participants still seem to be skeptical but are getting more and more engaged as the building is coming along. During the course we are taking up the „traditional“ and local natural building techniques – adobe and taquezal – and combine it with modern natural building techniques: Wattle and daub, wattle and cob, chorizo or rolled straw and malla ciclón that uses mesh as internal structure. All in all we are using six different wall-system techniques – load bearing and non-load bearing, traditional and modern. After the foundation was done and the posts were up, we started to introduce the different wall systems. On part of our building is made of adobe, which is load bearing and made of sun-dried earthen bricks. Taquezal has a wooden structure with horizontal bracing filled in with a dense mix of clay, sand and straw. For the Wattle and Daub we used bamboo stripes (Bambus Vulgaris) woven between upright stakes to form a basket-like wall which we covered with a sticky and wet mix composed of clay, fine sand, chopped straw and horse manure. Wattle and Cob is a technique that uses upright poles and you form snakes rich in straw and mud that meander through the sticks forming a pretty pattern at the end with the option of adding in bottle artwork. Chorizo uses clay slip and straw that is rolled around a stick, and in malla ciclón a mesh is used as internal structure and covered with a mix rich in straw. The last week of the course will be focused on finishing the wattle and cob walls, and the first finishing coats will be applied. Liz will introduce simple sculpting and creative wall finishes for an aesthetically pleasing but also functional building. The roof will go up and for the inside we are designing a seating area made of cob benches and little walls to create a cozy space where the students of the carpentry school can hang out during lunch. If time allows, we will finish with an earthen floor! It has been a great experience to help teach and learn in this context and I am looking forward to the last week! People have been starting to loosen up, getting to know each other and feeling more confident about themselves. Maybe my fun little games each morning helped with that 😉 At least they make everybody laugh at the beginning of the workday!